Western New York is an ideal place to start, grow or relocate a business. The region’s strengths include top academic and research institutions, highly skilled labor force and extensive transportation network, along with our close proximity to Canada and tremendous quality of life, including affordable housing. 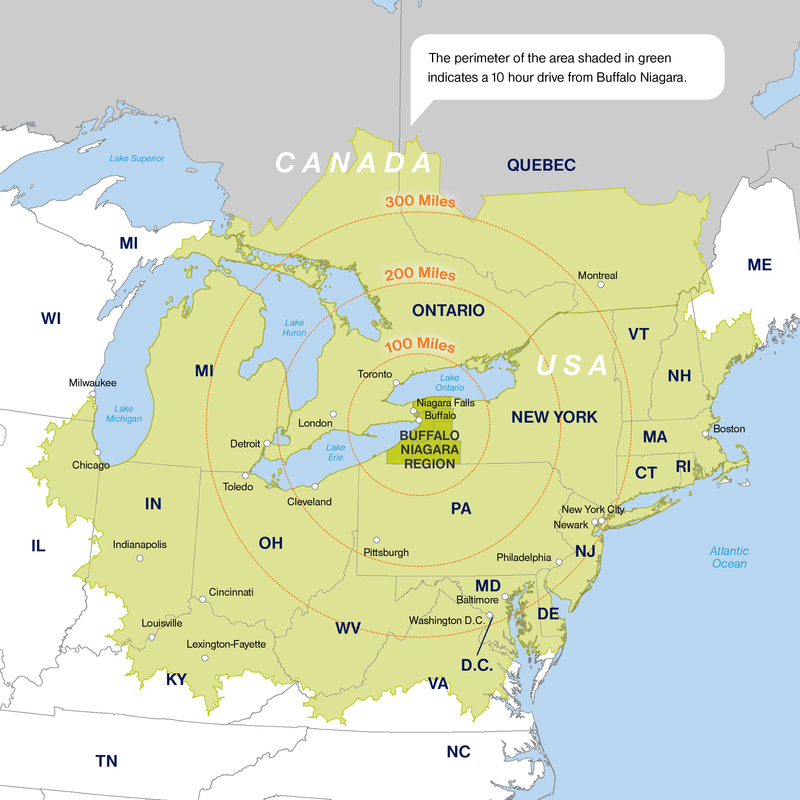 Strategically located on the border with Canada, we benefit from our prime location in the center of an internationally significant regional community and marketplace extending over 3,700 square miles from Toronto, Ontario to Rochester, New York. We are within 500 miles of 40 percent of the continental North American population and our waterfront includes both Lake Erie and Lake Ontario with the majestic Niagara Falls in between. The border location makes this an excellent shipping and logistics hub for both national and international trade. Low cost power, existing infrastructure, and highly rated colleges and universities all contribute to the area’s well-deserved reputation as a place where business truly can work. To remain competitive, New York State has implemented progressive economic development strategies and aggressive financial and tax incentives to stimulate growth and job creation. These incentives, including START-UP NY where businesses can operate tax-free for ten years, the Excelsior Jobs Program and low-cost hydropower, can help reduce start up and long term costs. We are particularly proud that Western New York is home to many outstanding and internationally known employers such as GEICO, Yahoo!, Delaware North, Roswell Park Comprehensive Cancer Center, University at Buffalo, M&T Bank Corporation, Moog Inc., Rich Products Corporation, Tops Markets LLC, Kaleida Health, HSBC Bank and many more. These businesses have chosen to call Western New York home because of region’s healthy business climate and leadership in some of the fastest growing industries around the globe. Let us be your business’ future for long term growth and prosperity. It is an exciting time for Western New York and businesses across the country and from around the world are choosing New York to locate and expand their operations. Thanks to a strong base of well-educated and skilled employees, a low cost of living and robust access to both U.S. and Canadian markets, Western New York has remained a strong and stable business region. View "Invest Buffalo Niagara: Perfectly Positioned for Success." View "Downtown Buffalo, NY: 2016 Development Guide." Search for sites and insights with Invest Buffalo Niagara's dynamic search tool here.